US armed forces in Iraq used the Boresnake to quickly clean combat weapons… they tossed their standard cleaning rods. Click Here Now to buy the Boresnake at Amazon + Free shipping and a discounted price. Worn gun cleaning rod threads makes it wobble and potentially scratch your gun bore. How do you take a 32″ cleaning rod to the shooting range? Jags and bore brushes have to be screwed in and changed. 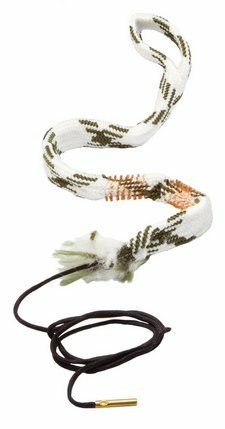 The Bore Snake is a long woven cotton rope with a weighted string attached to the front. The beginning of the bore snake has a large puffed ball of cotton where you can add gun cleaner, CLP or gun oil. Further down the snake are two embedded brass bore brushes followed by a length of wide woven cotton fabric that is squeezed in the bore tightly removing loosened carbon and copper fouling. The long woven snake provides a huge amount of contact area that scrubs, wipes and cleans the barrel bore. The Bore Snake is much more effective than a single or multiple patches. It has a much tighter fit than any patch with much more contact area. The Bore Snake is a perfect fit for field cleaning. The all-in-one gun cleaner rolls up and fits into any small bag or case. No parts to loose or misplace. There’s no screwing a brush or jag on nor replacing patches. Just add your favorite cleaner to the snake and pull it through the bore until it’s mirror clean. They are available in different sizes for shotguns, rifles and pistols. They roll up in a ball for easy storage. I keep mine in a zip lock bag. So what do you do when a Bore Snake gets dirty? Bore Snakes are machine washable. You can also hand wash them and reuse them over and over. They are pretty inexpensive so you can replace them when they get too dirty or worn out. 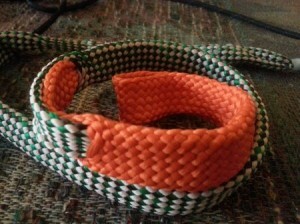 The heavy duty woven snake is tough and will last through many washings. Pulling the bore snake through the appropriate size gun barrel does take some effort. It is a very tight fit and really scrubs the bore. I wrap the weighted cord around my hand several times and then pull it through the bore slowly. 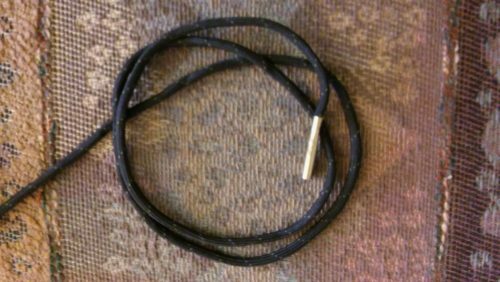 You can also wrap the cord around a screwdriver handle or wooden dowel for more leverage. I use one Bore Snake for cleaning and another one for lubrication unless I’m using a gun CLP. For shotgun cleaning they are indispensable. Shotgun bores are very easy to clean because there is no rifling nor copper fouling. I pull one through the barrel twice and it is mirror clean. It’s amazing how easy it is. Another benefit is you do not have to worry about damaging the bore or muzzle crown with a cleaning rod. I have also used a bore snake on an AR-15 rifle. It does work well and is much easier than a cleaning rod and bore brush. Just pull it through until the barrel is clean, usually about 5 or 6 times. Save over 40% on a Shotgun BoreSnake at Amazon.com. The Boresnake Viper is a newer bore snake with some enhanced features. The Viper Boresnake has 50% more bore brush to scrub and loosen ever more fouling. The original Bore Snake had a single bore brush embedded but the Viper has 2 brushes. 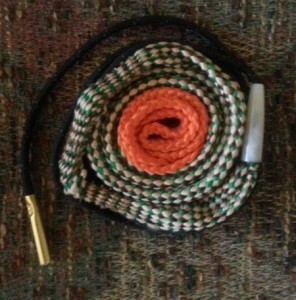 Hoppe’s also added a nylon cone to the front of the Bore Snake to make it easier to start down a barrel bore. The cone is like a guide for the bore snake. It works great. The Viper Bore Snake also features a lubrication zone which is towards the end. You can apply gun cleaner to the front and then oil to the rear lubrication zone. This kills 2 birds with one stone. It cleans and then lubricates in one pass. 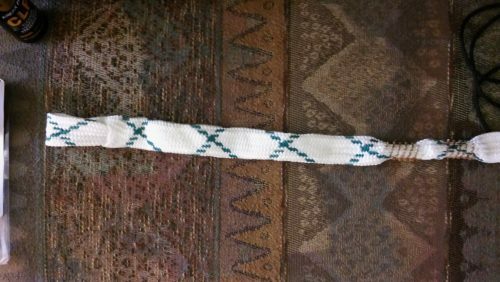 Here’s the Viper Bore Snake with its tightly woven rope. It is pretty hard to pull a bore snake through a barrel. You will be surprised how tight a fit it is. It’s amazing how much it cleans in just one pass. Here’s the Hoppe’s Viper Bore Snake rolled up for storage. You can stick it just about anywhere. Try that with a conventional gun cleaning rod. Here are the 2 bore brushes embedded into the Viper Bore Snake rope. 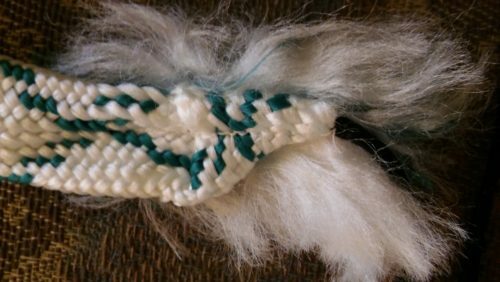 It provides twice the brushing power of the original Bore Snake. 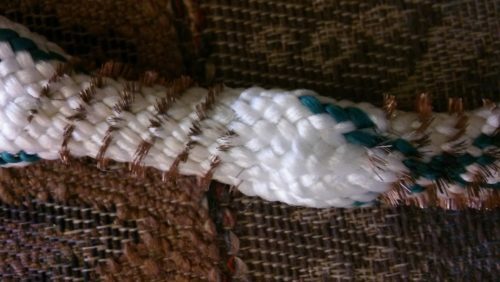 The Bore Snake rope has 160X as much contact area as any cleaning patch. It’s much more effective than 50 or 100 patches. 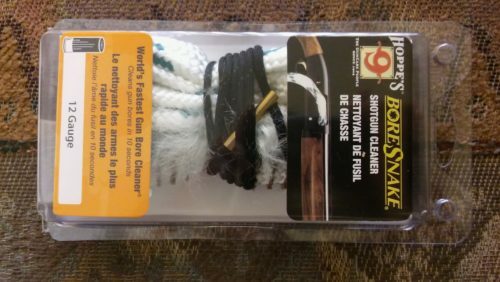 Here is the M-Pro 7 9 mm Bore Snake Cleaning Kit. 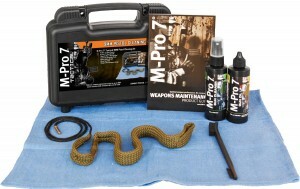 It features a 9 mm Bore Snake, M-Pro 7 Gun Cleaner, M-Pro 7 LPX Gun OIl, utility brush and carry case. This is the Hoppe’s Bore Snake Gun Cleaning Kit. 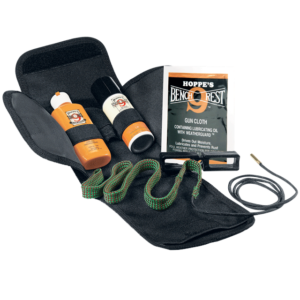 This kit is more compact and features a Bore Snake, Hoppe’s No 9 Gun Bore Cleaner, Hoppe’s lubricating oil, Hoppes Weatherguard Cloths and a pulling tool. This gun cleaning kit comes in a very compact case and can be stored just about anywhere. I can’t tell you how easy shotgun cleaning is with a Boresnake. I used one on my Browning Citori and Maxus Field shotguns. Both were 12 gauge and used for hunting and trap shooting. I would typically shoot 200 rounds in an outing. I then went home and cleaned them with the Boresnake. I was finished in 15 minutes…both shotguns too! 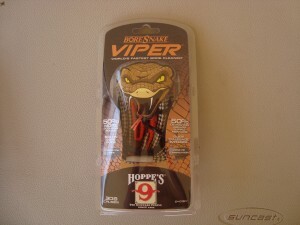 Here’s the Boresnake in the handy snap close packaging. You can also store them in a ziplock bag. Nothing is more compact nor easier to use. Boresnakes roll up in a nice ball so you can store them just about anywhere. 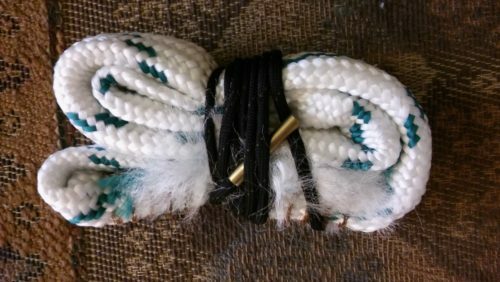 I use the pull cord to tie the rope up. The pull cord is super strong with a weighted copper tip. 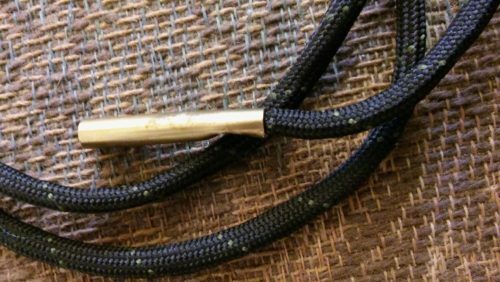 The weighted copper tip makes it easy to feed the pull cord down the barrel. You can use your hand to pull the boresnake through the barrel but I highly recommend you use some sort of “pull handle” like a dowel or screwdriver handle to wrap the pull cord around. It is quite difficult to pull a boresnake through a gun barrel. It’s a very tight fit. Here’s a close up of the weighted copper tip. The weighted tip pulls the pull cord down the barrel if you tilt or stand the barrel upright. 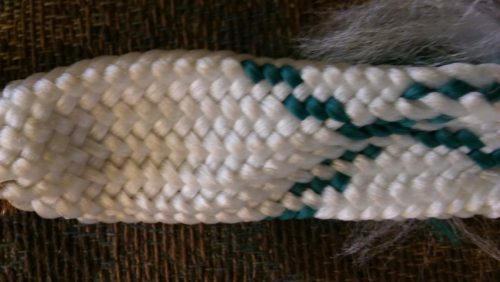 This is the front of the Boresnake rope. It’s a big cotton ball where you apply gun cleaner or CLP. It’s very absorbent and will hold a lot of liquid. It’s purpose is to coat the inside of the bore similar to a cleaning patch but will hold 10x as much liquid. The front of the Boresnake rope is folded to form a cone shape which makes it start down the bore much easier. This is the rope of the Boresnake. 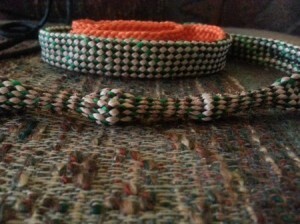 It’s cotton and finely woven into a super strong rope. The surface area is incredibly large like 160x that of a cleaning patch. It really scrubs and cleans the bore and is an extremely tight fit. Further down the Boresnake rope is the bore brush section which contains 2 embedded bore brushes. These bore brushes are bronze phosphor and will loosen carbon, copper, plastic and lead fouling so it can be wiped away. Here’s the rest of the Boresnake. The end is very wide and wipes the bore clean. I only used 3 passes on my shotguns and the bores were shiny clean. It is amazing. This close up of the Boresnake end loop gives you an idea of the thickness and cross knitting of the Boresnake. 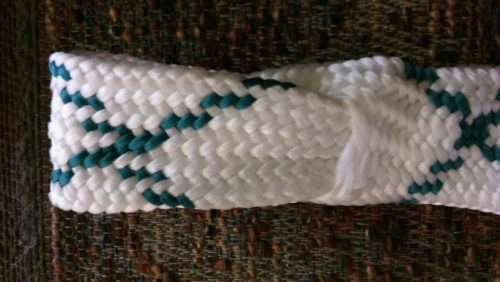 The cross knitting or weave enables it to clean extremely well. When you pull a Boresnake through a bore, you’ll know why it cleans so well. This entry was posted in Cleaning Tools and tagged bore snake by admin. Bookmark the permalink.